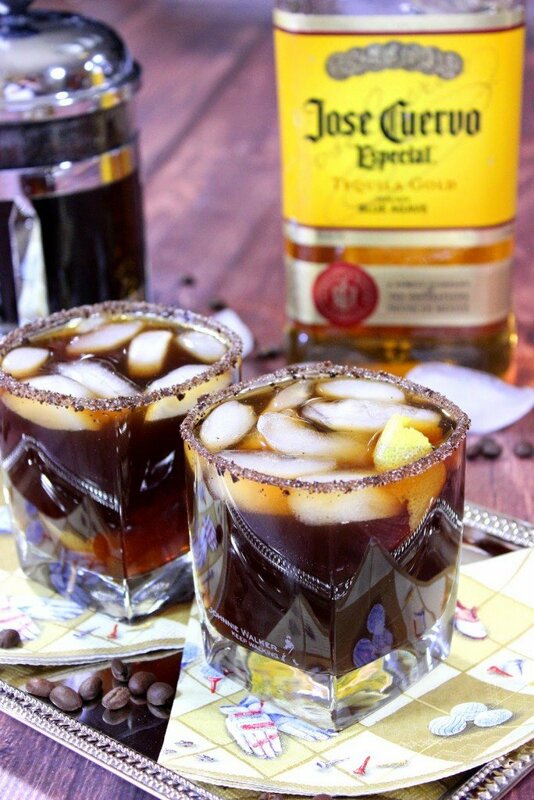 Iced Coffee Margarita mixed with tequila, a lemon twist and served in a rimmed glass of ground coffee and sugar. Talk about an eye-opener! It’s National Margarita Day, so you know what that means? When you’re sipping on an Iced Coffee Margarita, you don’t have to feel guilty about drinking in the morning! 🙂 But please remember to always drink responsibly!! **Please Note – The printable recipe card with detailed instructions, complete ingredient measurements, and nutritional information for making Iced Coffee Margarita is available near the end of this post. 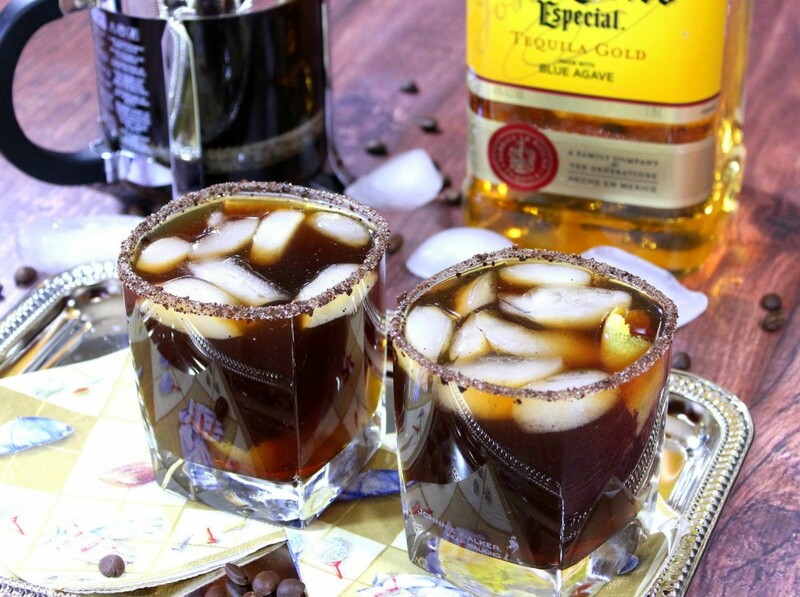 Cheers to Iced Coffee Margaritas! Drizzle a circle of honey on a plate the same circumference as the rim of the glass. On another plate, mix together the coffee grounds and sugar. Dip the rim of each glass into the honey and then into the ground coffee and sugar mixture. Fill each glass with ice and pour in the tequila and cold coffee. Twist the lemon zest, drop it in the margarita, and serve. While I don’t specifically endorse day-drinking (especially in the morning), there are just times you can make an exception. Think Sunday brunch, and National Margarita Day, when you’re talking about this delicious coffee cocktail, of course. 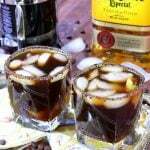 Below is the printable recipe card for today’s Iced Coffee Margarita. Twist the lemon peel to release the oils, drop in the cocktail glass and serve. I sincerely hope you’ve enjoyed today’s cocktail recipe for Iced Coffee Margaritas to celebrate National Margarita Day (or any other day for that matter) as much as I’ve enjoyed bringing it to you! Should you have any comments or questions regarding this recipe or anything else you’ve seen on my site, please don’t hesitate to contact me directly or leave me a comment in the comment section below. It is always my distinct pleasure to get back to you with a reply just as soon as I possibly can! Until we eat drink again, I hope you have a delicious day! Holy moly! I'm in love. May I have this instead of my morning coffee today?!? Thanks for sharing with #nationalmargaritaday. Oh my word! Genius! I have cold leftover coffee all the time 😉 Cheers! This is the margarita I was looking forward to most. 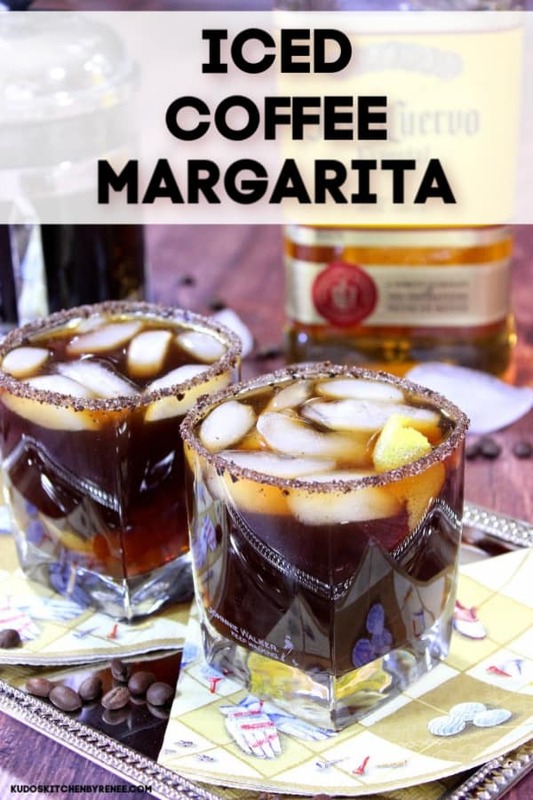 I LOVE coffee cocktails, and this is now at the top of my list of margaritas to make. Best idea ever! So fun participating in Margarita day with you! I had no idea it was National Margarita day as I'm not much of a drinker, but I am a lover of iced coffee and man it looks great! WHAT?! These sound amazing. What a great idea! What a fun idea! I've got some coffee flavored patron that would work really well in this too I think. The sugar and coffee rimmed glass is clever too! Oh this is my kind of coffee! An iced coffee margarita?! What?! Yes. Love everything about this. 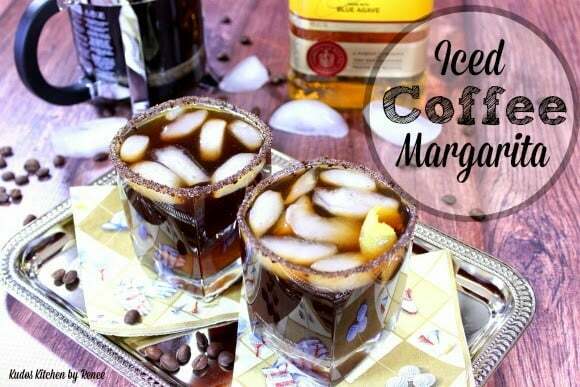 Okay being a margarita girl and a coffee girl I have got to try this. How fun seeing all the different inspirations for Nat'l Margarita Day! So much more fun to change it up with all these different flavors. I am a coffee girl so your recipe is calling my name! Cheers to Nat'l Margarita Day! This sounds amazing! I need to give it a try! If there's one thing I love more than margaritas, it's coffee so love that you combined them! Any excuse to drink a Margarita is a-ok in my book! Cheers! Ice coffee margarita!!!! You are killing me! This sounds sooooooooo good! That sounds like a breakfast margarita to me, Renee. Perfect! This is SO my kind of coffee! Brilliant! Just popping in to let you know I’ve included your recipe for Iced Coffee Margarita in my round-up of iced coffee recipes on Taste As You Go. Thanks for contributing, Renee! That’s awesome. Thanks so much for letting me know, Michelle! I appreciate it! I would have never though that coffee could be turned into a margarita, but those flavors make sense. I love the little bit of lemon to pep the coffee flavors up and keep it a bit true to its citrus roots. This is a really clever recipe! Thank you so much, Jenni! I’m thrilled that you like it. Thanks. It is unique. I’m so happy you like it, Justine!